Auchroisk is another distillery that rarely puts out a single malt, instead relagating the majority of its whisky to use for blends. Here’s its time to shine. This 25-year-old expression was distilled in 1990. Whiskies matured in refill American oak hogsheads and European oak butts were pulled for this release. It’s bottled at 51.2% abv and retails for $450. 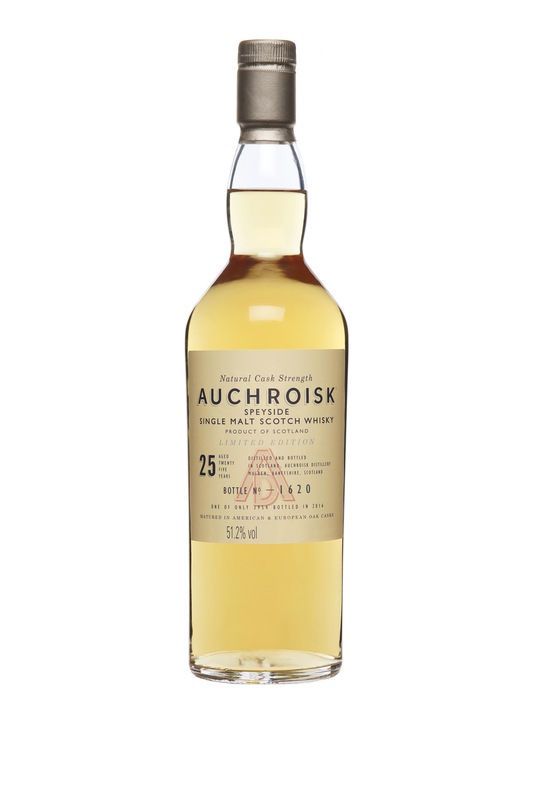 I have a bottle of the 20-year-old Auchroisk released in 2010, and loved it. What’s five more years of maturation do to this whisky? The fruity nose features fresh berries and orchard fruits, complemented by the smells of a French bakery, faint butterscotch and light oak. Orange zest and oak spice quickly lead to hints of mulled wine and espresso. There’s a nuttiness that comes across (with the rest of the palate in mind) as a peanut butter and jelly sandwich. I know, I know… Balancing out that nuttiness is a touch of salted caramel. The finish is clean overall, with faint hints of salted nuts, herbs and toffee.